Various parts of northeast India, more precisely the Brahmaputra valley of Assam, are presently witnessing an uproarious situation in the backdrop of the Centre’s initiative to amend the citizenship laws. The region observed a Northeast bandh (shut down) on 8 January protesting the Union government’s bid to pass the Citizenship Amendment Bill in the Lok Sabha and readying it for introduction in the Rajya Sabha. Many political observers across the country also start fantasising about another session of the historic Assam movement comprising more northeastern localities under its ambit. The Assam agitation, which started in 1979, culminated after six years with an accord signed by the agitators and the Union government in New Delhi in presence of the then Prime Minister Rajiv Gandhi. The public uprising, which was for detection and deportation of all illegal migrants (read Bangladeshi nationals) from Assam (meaning India), ended with a wrong resolution to identify the immigrants with the cut-off date of 25 March 1971. Leaders of the All Assam Student’s Union (AASU) and now defunct Asom Gana Sangram Parishad agreed to accept everyone entering Assam prior to the date as legal citizens. The Assam movement had started with the mission to deport all illegal migrants with the national cut-off year (1951) for which over 850 people sacrificed their lives and thousands others suffered in different shape and sizes. More surprisingly, the accord was never placed in Parliament for its endorsement so that it could have been given legal status. Now most of the civil society groups and a large section of writers, artists and media stalwarts in the region are hitting the streets opposing the Centre’s move to grant citizenship to the religious asylum seekers from Bangladesh, Pakistan and Afghanistan. They came out with a clear demand that the Narendra Modi-led government’s move for the benefit of Hindu, Sikh, Buddhist, Jain, Parsi and Christian asylum seekers from the three neighboring countries must be abandoned. Their logic includes that Indian citizenship cannot be conferred on the basis of religion as it is a secular country and if done it would go against the spirit of the Constitution. The other viewpoint, which has been supported by 95 per cent of protesting organisations, argues that Assam has already taken the burden of numerous illegal migrants (from 1951 to 1971) and it must not get more migrants as they would destroy the State’s demography and Assamese as a language. The protest gained momentum last year, when the Joint Parliamentary Committee (JPC) on the Citizenship (Amendment) Bill 2016 arrived in Guwahati in May for hearings. A number of indigenous organizations, local politicians, intellectuals, media personalities etc assembled at the venue and raised their voice against the move. However, subsequent hearings in Silchar of Barak valley witnessed a different picture as most of the organisations supported the bill. When the Lok Sabha passed the bill on 8 January, the anti-bill protests got escalated in northeast India. 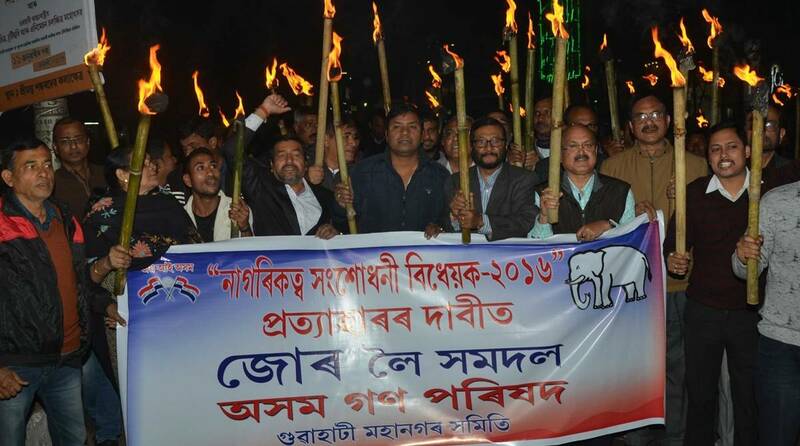 Assam’s Brahmaputra valley took the lead in the movement with a series of demonstrations. The local media space remains full of anti-bill statements, news related to agitations and also newspaper editorials and television talk shows. But most of the public debates have lately been influenced by Assam’s most powerful minister Himanta Biswa Sarma where he repeatedly commented that the citizenship amendment initiatives would only benefit the Assamese population and few anti-Assam forces (read Naxal/ Leftists) continued crying against the Citizenship Amendment Bill. In a recent tweet, Sarma stated that the Left elements always use character assassination and intimidation as their tactics, but this would never succeed in changing his views on the bill. “They want us to be slaves of a particular civilization (read Islamic). However, in this civilisational fight, we must win. Assam and India must win,” he added. In various public discourses, Sarma openly suggested that Assamese people should support the non-Muslim asylum seekers from Bangladesh to safeguard their political, social and cultural rights in Assam. Expressing his serious concern over the aggressive mentality of Bangladeshi Muslims in the State, Sarma asserted that the said bill, if passed in the upper house of Parliament, would be able to prevent Assam from becoming another Kashmir. As the bill is designed to protect the Hindus in the country, it would finally safeguard the identity of indigenous populace of Assam as well northeast India. However, AASU along with its 30 other civil society organizations continue warning the government that if the bill is passed in Rajya Sabha, Assam would burn. AASU adviser Samujjal Bhattacharjya in various public meetings commented that the BJP-led governments in both New Delhi and Dispur were hatching conspiracies to destroy the peaceful ambience of the State as the Citizenship Amendment Bill would destroy the prospects of Assamese language and also threaten the very existence of indigenous people across Assam. Lately Meghalaya chief minister Conrad Sangma and Mizoram chief minister Zoram Thanga, both with the National Democratic Alliance, have publicly raised their voice against the bill. Even Manipur chief minister N Biren Singh from Bharatiya Janata Party has expressed his concern over the probable negative implications of the initiative in his State. Similarly, the ruling ally to Tripura’s BJP led government (IPFT) has also opposed the bill. Amidst all opposition, Assam chief minister Sarbananda Sonowal came out with strong logic to support the bill. Remaining silent over the matter for months, Sonowal recently made his comment loud and clear that those who opposed the Assam agitation were now making a hue and cry against the bill. He insisted that the Centre’s initiative would never harm the local population, but benefit them in the long term. Sonowal categorically stated that a section of vested interests was hell bent on creating disturbances in Assam by spreading misinformation that 1.90 crore Bangladeshis would get citizenship as an outcome of the Citizenship Amendment Bill. Being the son of the soil he would never endorse any harm to the indigenous people of the State. Arguing that the Centre’s recent steps to provide constitutional safeguard to the indigenous people and granting ST status to six communities of Assam would permanently secure interests of the locals, Sonowal urged leaders of AASU, AGP (which has recently snapped ties with the government over the issue) and distinguished personalities to wholeheartedly extend cooperation in implementation of clause VI of the Assam accord.